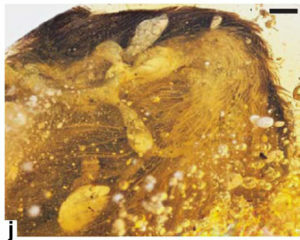 This week an exciting new article was [published]: two bird wings trapped in amber! The specimens were found in Myanmar. 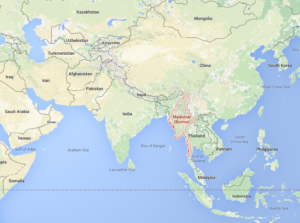 Myanmar is in Southern Asia. Amber is what happens when tree sap is fossilized. 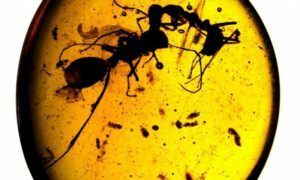 Anything that was stuck in the tree sap while it was a liquid remains preserved in the amber forever. Two ants fighting in amber. Photo by Phil Barden and Dave Grimaldi. The sediments are mid-Cretaceous in age, therefore from the Mesozoic. 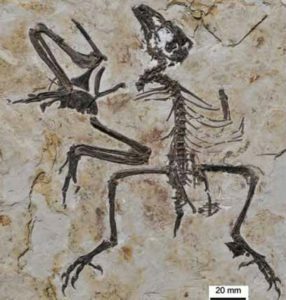 The fossils are 2 partial wings and are thought to be from enantiornithine birds. 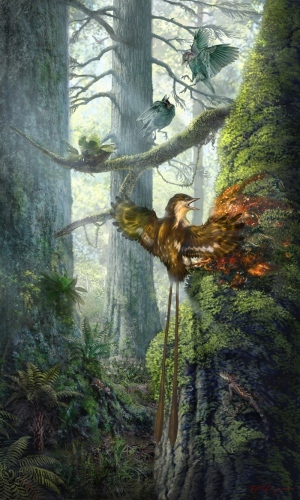 These birds are an entirely extinct radiation of early birds that still have teeth. Elliot the enantiornithine from Dinosaur Train (from PBS). Usually, enantiornithines and other early birds are preserved entirely flat. Even though we sometimes get feather impressions, we lose a lot of information because the specimens are so squished. Parabohaiornis, an enantiornithine preserved flat (from Wikipedia). These new specimens are preserved in 3D! And the part of the wing that got stuck is completely intact. Figure 1j from the paper showing one of the wings. From the bone proportions, we know these two specimens were juveniles. The preserved feathers are very developed, indicating that these juveniles were precocial (able to move around well as soon as they hatch). Because the feathers are so well preserved, we can see what color they were (brown and pale/white, probably in bands across the wing). Lastly, one of the specimens has claw marks within the amber, showing that the bird was still alive when it got trapped. This specimen is so rare and incredibly preserved that it will help answer a lot of questions about feather morphology and preservation in other enantiornithines and early birds in general. Because of these new fossils, we know that the modern layout of feathers was already present 100 million years ago. 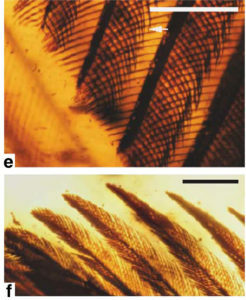 Images 1e and 1f from the paper showing the details of the feathers. This entry was posted in English and tagged amber, Enantiornithine, feathers, Myanmar, wings. Bookmark the permalink. One Response to Bird Wings in Amber!